If you’ve recently had a tooth or multiple teeth fall out, don’t panic! 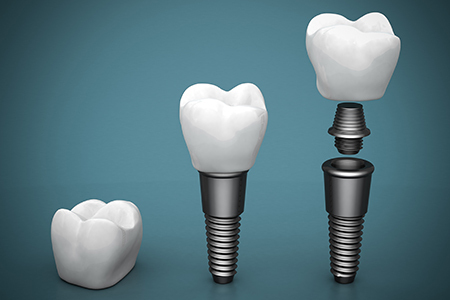 Hendersonville Family Dental offers dental implants as an advanced and comfortable tooth replacement option. After losing a tooth, you most likely feel less comfortable speaking, eating, and doing every day activities. Fortunately, dental implants offer a firm support to artificial teeth and will feel more natural than typical bridges or dentures. When you meet with our dentists to determine whether or not you’re a good candidate for dental implants, we will look at your jaw structure to ensure that you have enough bone for the procedure. If you are in good general health and your jaw can support an implant, this treatment may be a good option for you. If your dentist recommends implant treatment, careful oral hygiene is essential for the success of the implant. Using x-rays, we will carefully determine the correct placement of the implant. Then, the dentist surgically places the implant into the jawbone. During the healing process, the jawbone grows around it and holds it in place. The implant will be completely fused with the bone within 2 or 3 months. Your custom-made prosthesis will look natural and comfortably fit in your mouth. Replacement teeth usually take some time to make. In the meantime, your dentist may give you a temporary crown, bridge, or denture. To schedule a dental implant consultation to discuss how implant works and whether or not you are a good candidate, give Hendersonville Family Dental a call today at 828-222-7878.